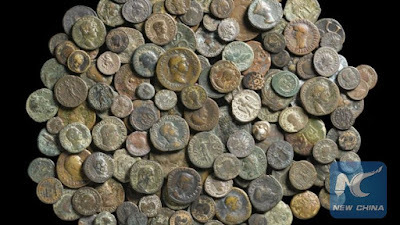 A vast collection of ancient coins from far-flung locations across the globe, including Syria and China, has been discovered tucked away in a drawer at a castle in Britain. The unique set, comprising 186 coins in total, spans twenty-five centuries of history, the National Trust (NT), custodians of Scotney Castle said Saturday as the collection went on show to the public for the first time. "We know that Edward and Edwy Hussey had a great interest in collecting, but this considerable cache of fascinating coins shows just how much their interest grew into a collection of exceptional importance. What is a mystery though is why a collection of this caliber ended up at the back of a drawer." "It was a delight, as a coins specialist, to examine such a significant and diverse collection. A particular highlight was seeing Roman coins that rarely appear in Britain, such as those of the 3rd century emperors Balbinus, Pupienus and Aemilian, none of whom ruled for more than a year." The NT said the coins were found by volunteers at the castle as they searched for photographs in a study drawer. Research into family diaries in the archive suggests the coins were amassed during the nineteenth century by avid collector Edward Hussey III and his son Edwy, who lived at the castle. Scotney Castle was the Lamberhurst home of the Hussey family for 200 years before it was left to the trust. The NT opened it to the public in 2007.